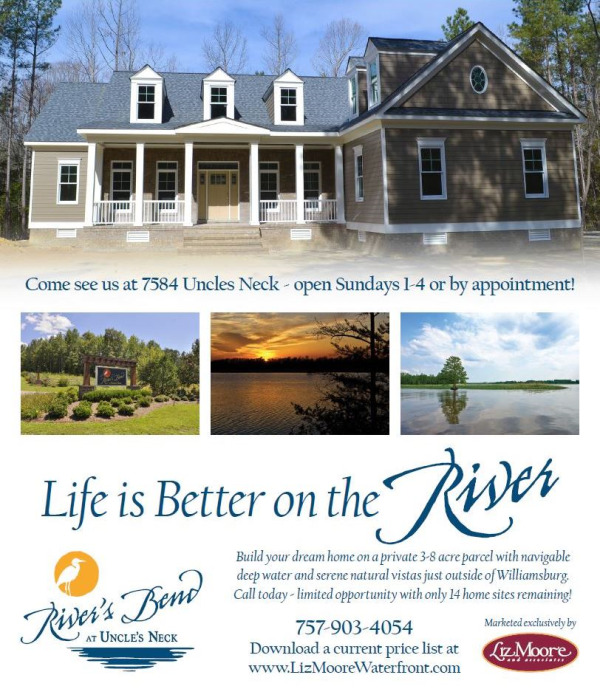 Come see us at 7584 Uncle's Neck - open Sundays from 1-4pm! This Custom Craftsman style home, located in River's Bend at Uncle's Neck, is under construction by award winning Hallmark Builders. Located on over 4 acres of wooded privacy, this unique home features an open floor plan with upgraded appliances and features throughout. Enjoy the beautiful sun/keeping room overlooking your own private retreat. River's Bend at Uncle's Neck is a small, private community enclave surrounded by natural wildlife sanctuaries and woodlands dedicated to the Williamsburg Land Conservancy. Residents can enjoy the various recreational opportunities including boating and fishing on Uncle's Neck Creek or the Chickahominy River, nature trails and wildlife meadows. Follow our progress on Facebook as more new homeowners join this magnificent new community, or watch our video at lizmoorewaterfront.com. For more information on the home under construction, email us at concierge@lizmoore.com or click below to download the floor plan and feature sheet.